The count down is now on at 30 weeks of pregnancy, with approximately 10 weeks to go until full term. With your expanding size you may be finding it more and more difficult to sleep and get the rest you need at night. The best sleeping position when pregnant is on your left side, you may also find that a pregnancy body pillow helps you to feel relaxed and supported. It can also be very difficult to move at night and you may begin to feel constrained by the size of your tummy. Try wearing less restrictive sleep wear, even silk or satin pajamas might make a big difference to how easily you can move in bed. If you are still not getting the rest you need at night, try getting some rest during the day but having some short naps. Heartburn can also disrupt your sleep, but can come on at anytime during the day. The main reason for heartburn during pregnancy is caused by your growing uterus, shifting your internal organs. If heartburn affects you at night time, try propping yourself up in bed. It can help to avoid spicy, greasy or heavy meals for dinner, before going to bed. Try to always remain seated for 30 to 45 minutes after meals to avoid heartburn. Once again you will benefit from eating smaller meals rather than 3 large meals a day. Another common complaint during pregnancy is swelling, especially to your ankles, or what you may now be calling cankles! You can become quite puff especially at these later stages of pregnancy, about 75% of pregnant woman suffer from mild edema. Fluid retention can be particularly worse on a hot day or where you have spent a lot of time on your feet. Try putting your feet up when possible to alleviate some of the swelling. A foot rub from your partner can be a nice gesture after a long day on your feet. While puffiness is quite common, if you suffer from swollen hands or face in conjunction with high blood pressure or sudden weight gain, consult your doctor. As your baby grows, room to move in your uterus is becoming quite limited. You may even find that your tummy looks very strange at times with you little one moving around trying to fill every space he/she has. Measuring about 40cms from head to toe, your baby weighs in at approximately 1.3kgs, putting on about 200 or so grams each week until birth. The acrobatics will soon settle down to simple nudges from elbows and knees as space becomes limited. You can most likely identify your babies sleeping patterns at this stage of pregnancy as every movement is very easy to feel. You may even notice things such as hiccups as your baby practices breathing, ready to take the first breath after birth. 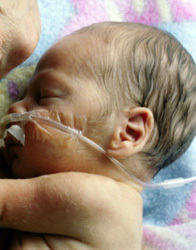 His/her lungs are now capable of breathing air, however if born at this stage would most likely need some assistance. At 30 weeks of pregnancy your baby is strong enough to grip your fingers. He/she may even be practicing sucking his own fingers preparing for feeding. Permanent teeth have even developed and wait in your baby’s gums until the time comes for them to pop through.